Which airport in Iceland do I need to book a flight to? You will need to book a flight to KEFLAVIK AIRPORT (KEF), Reykavik’s main international airport situated 50km southwest of the capital. What flight times should I book to coincide with your transfers in Iceland? Our transfer pick up and drop off points are Keflavik Airport and Reykavik City for this tour. The procedure for booking flights is quite specific. You will need to book them yourself departing form an airport that is most convenient for you. There are many budget flights leaving the Uk and Europe to Reykjavic, Iceland. You can search for best deals on Skyscanner and there are many return flights costing around £85 ( return flight from the UK ) which is an excellent price. We advise that you book a flight that arrives in Iceland at mid afternoon and you will be met at the airport around 6/7 pm to make the 3 hour journey to your accommodation. We will arrive around 9/10pm and it will be too late for dinner at the hotel, so please eat at airport or bring something with you! If you arrive early in the morning and wish to do some sightseeing, make sure you can meet the transfer either at the airport or at our pick up point in the centre of Reykjavic. We reccommend that you book a flight that departs in afternoon as you will be collected from the hotel around 9am and will arrive at the airport around 12 noon or 1pm. It is therefore best to ensure your flight is no earlier that 2.30pm. If you wish to add on days in Reykjavic, we will do a pick up and drop off in the city center en route to the airport. So you can book extra nights in a city hotel or at the airport hotel if you have a very early flight the next day. The airport hotel is about 30 minutes from the Blue Lagoon and if you want to spend the afternoon and evening there on 23rd, you can get a taxi or bus back to the airport hotel. Choose your preferred timings and duration of your holiday and let us know before you book anything. We are available for any advice if needed. If these transfer times are not suitable for you, we recommend staying at the airport at the Hotel Smari (www.hotelsmari.is) which is situated right next to the airport. Rooms are very well sound proofed and the hotel is comfortable and reasonably priced. UK citizens do not require a visa to enter Iceland. Please check with the Icelandic Embassy if you are a citizen of a non-EU country to find out about Iceland entry requirements. 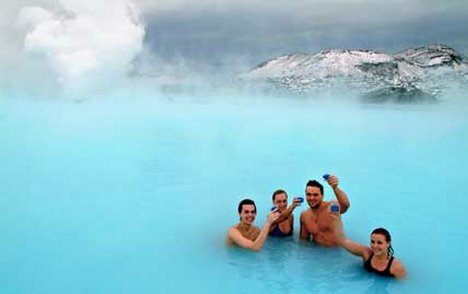 If you arrive at Keflavik Airport with hours to spare before or after our transfer, we suggest a visit to the blue lagoon (23km away and 20 mins in a taxi from the airport). Visit www.bluelagoon.com for prices and to make a booking. We recommend the restaurant at the Blue Lagoon – it really is worth a visit. Alternatively, visit Reykjavik via taxi or public transport. Our transfer picks up from Reykjavik so we can collect you from our designated pick up point in the city after exploring. Please let us know if you are interested in starting your transfer from Reykjavik. We shall organise a minibus to take our guests from the airport to Reykjavik if we have a sufficient number of clients interested in visiting the city (reasonably priced). Alternatively, book accommodation in Reykjavik before or after your tour ensuring you are able to meet our transfer bus in Reykjavik (times above). You will need to arrange your own return transfers to Reykjavik from the airport. Please visit www.kefairport.is/english/ for information about transfers to Reykjavik from Keflavik Airport. As mentioned above, we think a visit to the http://www.bluelagoon.com is really worthwhile. The Blue Lagoon is only 20 minutes away from the airport by road and taxis are available in front of the airport terminal in connection with all incoming flights. If you want to visit the Blue Lagoon from Reykjavik, your hotel reception staff can help with private transfers.